Hybrid Clouds: are we there yet? The simplest way of cloud computing: renting virtual machines to avoid hiring infrastructure people. It is very tempting for "developers startups" that simply want to develop and let a software service. Buying hardware and getting support of a third party integrator is a costly and time consuming endeavour: you do not know how succesful your application will be so you might over or undersize the hardware. If you have no infrastructure knowledge in house and you have to call in the help of a third party integrators for every little problem or upgrade, consulting costs will explode quickly. After a few years, your integrator is the only one with intimate knowledge of your server, networking and OS configuration. So even if the integrator is too expensive or gives you a lousy service, you can not switch quickly to another one. Developers just want an OS to run their software on, and that is what the public clouds deliver. 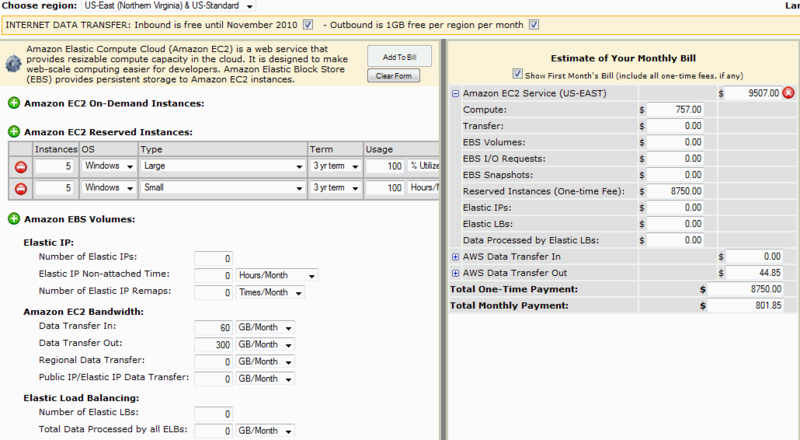 In Amazon EC2 you simply chose an instance. An instance is a combination of virtual hardware and an OS template. So in a few minutes you have a fully installed windows or linux VM in front of you and you can start uploading your software. Getting your application available on the internet could not be simpler. The number of instances on EC2 grows with an incredible pace, so they must be doing something right. According to Rightscale, 10.000 instances were launched per day at the end of 2007. At the end of 2009, this number was multiplied by 5! In theory, using a public cloud should be very cheap. Despite the fact that the public cloud letter has to make a healthy profit, the cloud vendor can leverage the economies of scale. Examples are bulk buying servers and being able to invest in expensive technologies (cooling, high efficient UPS) that only make sense in large deployments. The reality is however that renting instances at Amazon EC2 is far from cheap. A quick calculation showed us that for example reserving 10 (5 large + 5 small) Amazon EC2 Windows based instances cost about $19000 per year (Tip: Linux instances cost a lot less!). The one time fee ($8750) alone costs more than a fast dual socket server and the yearly electricity bill. As you can easily run 10 VMs on one server, it is clear that adopting an Amazon based infrastructure is far from a nobrainer if you have the expertise in house. The cost savings must come from the reducing the number of infrastructure professionals or third party consultants that you hire. Very rarely do people actually need cutting edge. Even if you think you do; more often than not a good SAN operating across a few dozen spindles is much faster than you think. Storage on a small scale is tricky and expensive; storage on a large scale is easy, fast and cheap. You'd be surprised how fast a good SAN can be (even on iSCSI) if you have the right arrays, HBAs and switches. And "enterprise" cloud providers like SunGard and IBM will sell you storage, and deliver minimum levels of IOPS and/or throughput. They've done this for at least 5 years (which is the last time I priced one of them out.) It's expensive, but so is building your own environment. And remember to take into account labor costs over the life of the equipment; if your IT guy quits after 2 years you'll have to train someone, hire someone pre-trained, or (most likely,) hire a consultant at $250/hr every time you need anything changed. I love these articles about IT stuff in large enterprises. "It won't let you tripple your VM resources in a few minutes, avoiding a sky high bill afterwards." Triple has an extra "p."
"If it works out well, those are bonusses,"
I admit first i am no expert in this field. But Rackspace Cloud Hosting seems much cheaper then Amazon. And i could never understand why use EC2 at all, what advantage does it give compare like RackSpace Cloud. Arh.. somehow posted without knowing it. And even with the cheaper price of Racksapce, i still consider the Cloud thing as expensive. Metro Clusters aren't new and you can already active active metro clusters on 10MB links with a fair amount of success. NetApp does a pretty good job of this with XenServer. Is it scalable to extreme levels, well certainly it's not as scalable as a Fiber Channel on a 1GB link. This is interesting tech and has promise in 5 years. American bandwidth is still archaically priced and Telcos really bend you over for fiber. I spend over 500k /yr on telco side network expenses already and that's using a slew of 1MB links with fiber backbone. 1GB links simply aren't even available in many places. I personally don't want my DR site 100km away from my main site. I'd like one on each coast if I was designing this system. It's definitely a good first step. Having worked for ISP's I think they may be the only people in the world that will find this reasonable to implement quickly. ISP's generally have low latency multi GB link Fiber Rings that meshing a storage Fabric into wouldn't be difficult. The crazy part is it needs nearly the theoretical limit of the 1GB to operate so it really requires additional infrastructure costs. If a Tornado, Hurricane, or Earthquake hits your datacenter 100km away will likely also be feeling the effects. It is nice to replicate data with however in hopes that you don't completely loose all your physical equipment in both. How long lasting is FC anyway. It seems there is a ton of emphasis still on FC when 10GB is showing scalability and ease of use that's really nice. It's an interesting cross roads for storage manufacturers. I've spoken to insiders at a couple of the BIG players who question the future of FC. I can't be the only person out there thinking that leveraging FC seems to be a loosing proposition right now. iSCSI over 10Gb is very fast and you have things like Link Aggregation, MPIO, and VLANS that really help scale those solutions and allow you to engineer some very interesting configurations. NFS over 10GB is another great technology that makes management extremely simple. You have VHD files and you move them around as needed.